There is a football revolution growing quietly, yet purposefully, across East African nations. Whilst most clubs and leagues outside of Australia grow from club to region to nation (or something similar), the growth across some African nations has been the opposite. National teams growing and filtering down to more localised growth. It is unique, and just possibly a blueprint for others to follow. To achieve it, the key pillars are a love of sport – any sport – and a liberal sprinkling of desire, determination, dedication, unity and faith. Tom Purcell is not the only person to have driven this remarkable growth – a growth that sees teams from Kenya, Tanzania and Uganda competing already and may soon add South Sudan and Rwanda. He works with a huge group people – ministers, teachers, students and so many others – to bring together an amazing sporting achievement. Tom was happy, however, for an interview to discuss the many aspects involved in one of Australian football’s most remarkable footholds. Like most Melbournians football has always been part of me. I played as a junior with Noble Park and just loved catching the tram to the Lake Oval and stand behind the goals voraciously watching my heroes play for South Melbourne. I am 52 years of age and there has never been a year in my life I have not been involved in a football community either as a player, coach, teacher, parent or some other role. I just love a football community. Presently, I am coach of the SKOB Saints women’s team in the VAFA, and watch my son play for Inverloch in the West Gippsland League and my daughter for Kew Comets on a Sunday. What was the catalyst for your connection to Kenya, and how did the football originally manifest itself within that? I have been a school teacher for over 30 years and always had a passion for social justice. I fell in love in South Africa with a man called Steve Biko who gave his life for the freedom, equal rights and liberation for Africa. I was fortunate to work at St Kevin’s College who had links in South Africa and East Africa and visited these countries on a conference. I decided to set up/resurrect the foundation called Zimele that Steve Biko started, and began to bring university students and adults on immersions to experience the great joy and warmth of the Kenyan people. Sport has always been a great leveller and awesome way to build community so we introduced Australian Rules football at Brother Beausang in Kenya. Most of the children here come from the slums in the local area and live on less than $2 a day. The Kenyans love Australian Rules football. The Kenyan students learned the skills and rules in no time under the coaching of the school principal Peter Shanahan. Part of the immersion also saw us go to Edmund Rice Sinon in Tanzania where we also introduced Australian Rules football. After two years we decided to sponsor an exchange between the two schools that involved Netball, Volleyball, Australian Rules and debating. 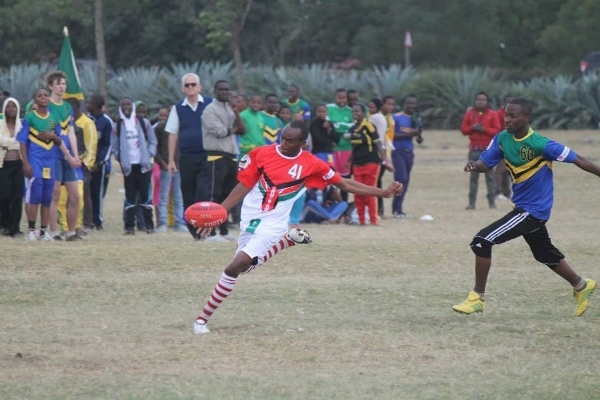 The exchange takes place every year and we have had two fantastic historic games played of Australian Rules football between the Kenya Buffalos and Tanzanian Lions. In the last ten years we have taken more than 150 participants to East Africa and this year we are introducing girls to the game. Can you tell a little more about the player catchment via ministries and schools and how the game is interconnected with education and faith? The players come from the school communities we visit on our Immersions. We started Zimele at St Kevin’s College and our players came from Brother Beausang in Kenya and Edmund Rice Sinon in Tanzania. Over the last three years I have been working at Trinity Grammar and started Harambee where we visit Kenya Uganda and Rwanda with our ministries. Uganda in particular love the game and practice twice a week and probably have the strongest squad in East Africa. This July we are having our first ever Tri Nation Aussie Rules Carnival with the Uganda Cranes, the Kenya Buffaloes and Tanzanian Lions all playing against each other. The game is very interconnected with education and faith. When we go on our immersions the focus of the trip is to immerse ourselves in the lives of the African people we walk with. We visit the slums, are involved with house visits, assist in HIV clinics, help with teaching in schools and celebrate in the life, faith and community everywhere we go. Football and sport helps bring us all together. The exchange is also a great opportunity for young Africans to visit other countries on a cultural exchange and see the world from a different perspective. Many of the children come from the slums, have only one parent or are orphans so the opportunity to visit another country and play Australian Rules football is a great educational and faith experience. What are the prospects of further growth within Kenya? There is great opportunity to expand the game in Kenya. It just takes committed teachers to have a passion for the game. We have had a kick in Iten and the talent is phenomenal. In Iten I have met an Irish Brother who has trained over 30 Olympic and world champions. Brother Com believes that [Kenyans] are the best athletes in the world and would be the best at any sport they play. I am hoping in July to run a coaching conference for all interested teachers to introduce our great game into their schools and the response has been positive. Don Cruttenden is based in Nakuru and teaching Australian Rules here. The biggest hurdle to the expansion of Australian Rules football in Africa has been getting access to suitable playing fields. However now that we have introduced AFLX I can see more and more countries adopting our game and especially this [AFLX] format. The soccer field will be an instant success to the growth and development of our game in East Africa, I believe in five years’ time there will be an international AFLX Competition and Kenya, Rwanda and Tanzania will all field teams. This year we will be introducing Australian Rules football to Rwanda in May and South Sudan in July. It is possible for the game to expand but it takes time and patience and the important thing is to build relationships and community for this to happen. Hopefully we will get the opportunity to support school communities with their education and health in the Congo and Burundi and other countries in Africa and from there Australian Rules Football will be introduced and grow. It is all about working together and building community that lays the foundation. How does the sport work to enhance the lives of the young people who play or could play? Sport empowers people to get the best out of themselves and each other. Sport lays the foundation of being able to cope with the challenges that life presents you along the way. Sport teaches you discipline, never to give up. The importance of trying to improve each day and the value of working as a team. Sport as we know breaks down barriers of discrimination, disadvantage and embraces equality. Sport helps you cope with defeat, disappointment and setbacks. Sport enables you to dream, to believe in yourself, to get the best out of yourself. Sport enables you to see the value of belonging in a community and working together for a greater purpose. I think sport is a great foundation for life. Naturally there is also the importance of being fit and helps with mental; alertness, a balanced life and good health. As we discussed, the political climate across the countries mentioned I not seen as stable, which as we discussed is really a myth. But does that perception play a part in your ability to seek funding/sponsorship for programs? (I really hope not). The political climate in the countries I have visited in East Africa is challenging. In the slums we visit children who cannot afford to go to school for $100 a year and instead search bins for reused charcoal all day to sell for a meal. The lack of clean water, sanitation, and poverty is difficult to accept. Governments seemingly do not do enough for their people. All the countries I visit are fairly safe. We have never been in danger in any country. The people are all so happy and welcoming. It is actually a gift to see people live with such generosity and spirit when they have so little. Getting funding and sponsorship is a 24/7 passion. The poverty is too extreme to walk away from and the difference every dollar makes is incredible so I am inspired to try to get as much support I can for our Zimele and Haramabee ministries. I am overwhelmed at the generosity of other people. I have found nearly all people are happy to give if they connect to the story and understand where the money they give is going. We have Harambee and Zimele committees that work very hard and a number of Harambee and Zimele events that raised together about $300 000 a year. I hope that we will continue to grow so we can help more children have greater opportunities in Africa. We have three immersions a year that anyone can come on. They are every January, July and September. They are such a gift to be part of. I don’t believe there is a better way to experience Africa. Home visits, schools, slums, HI clinics, community gatherings, The Nile, Rift Valley, running through the hills of Iten with great Kenyans and playing Australian Rules Football. The gift of the immersion is that it is a life-time journey. Once Africa is in your DNA it never leaves you. It is a life- time ministry of changing people’s lives and the greatest gift of any immersion is just how much the experience changes yours. 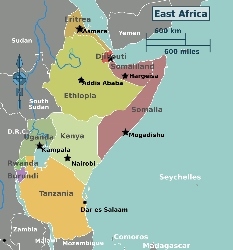 The programs across East Africa could one day be implemented, at least in part, across other parts of the world. Primarily, the work across East Africa is about humanity. But following in the trail of that comet is a sport which has, against many odds, grown in a way that few could have predicted even as few as ten years ago. It is to the credit of Tom and the other people he collaborates with and works beside that Australian Rules football is growing in African nations not usually associated with the game. If this success could be harnessed in partnership with the many footballers from African nations already in the AFL system in Australia (Majak Daw, Aliir Aliir, Mabior Chol et al), something truly amazing could be about to happen to our game in East Africa.